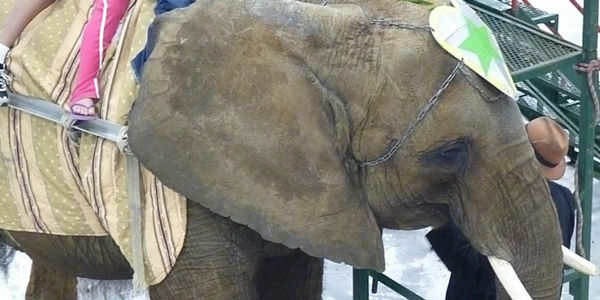 Nosey is a 30-year-old elephant born in Zimbabwe who has endured a life of hardship and abuse. She has been forced to travel and perform with Hugo Liebel and the Florida State Family Circus since 1988. This summer, she was dragged around from festival to festival, from state to state, and forced to give rides. Despite the fact that elephants are highly social and require the company of other elephants, Nosey has been held alone for 24 years. The US Department of Agriculture has documented nearly two decades worth of Animal Welfare Act (AWA) violations concerning this elephant, yet no action has been taken to remove Nosey from an abusive and utterly unacceptable situation. This includes repeated failures to provide veterinary care, and safe handling violations. Confiscate Nosey now and send her to a sanctuary where, after a life of solitude and torment in the circus industry, she can get the specialized care she needs.